Don't you love it when something just really, really doesn't work out? Great feeling. How could not love these bootleg monstrosities? "Eh, just leave it like it is. People will get the gist." Maybe she was speeding off toward a place Far Far Away. Either way leave it to the ruthless trolls of Twitter to step up and roast someone to oblivion who can't keep it under the speed limit, while wearing Shrek makeup to boot. 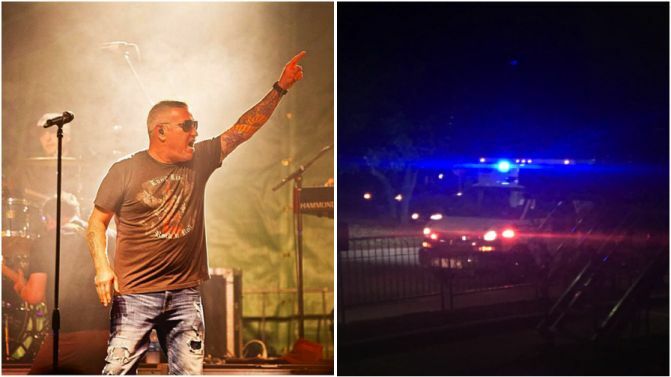 Smash Mouth was performing a headlining set at the Urbana Sweetcorn Festival when their lead singer, Steve Harwell, collapsed mid-set. Fans were left trying to figure out what the hell was going on. Still, the show went on as the band continued to play and even closed the set with their Smash hits 'I'm a Believer' and 'All Star'. According to those in attendance, after Harwell left the stage the crowd reportedly began chanting "Shrek", leaving the remaining band member with no real option but to perform the cult classics. Did you know Chris Farley was the original choice to voice Shrek? Well, it's true. Unfortunately, the comic actor died after finishing most of the dialogue for the first film, leaving what work he did lost in Hollywood's basement. That is until a short video of Farley's acting over Shrek storyboards leaked its way onto Reddit Aug. 5. The video shows a less wacky, more down-to-earth character, which just makes the whole thing so much sadder. Speaking to Yahoo News, Farley's younger brother Kevin Farley explained how the Shrek character had to change. Originally the Shrek character was a little bit more like Chris, like a humble, bumbling innocent guy. I understand why [they replaced him]. hey probably wanted to make Shrek 1, 2, 3, 4, 5, so… The studio needed to do what they needed to do. It was a bad time, bad timing… a tragedy. Mike did a great job with Shrek. He knocked it out of the park. Chris Farley died of a drug overdose in 1997. He's had something of a revival in the past few months, with the release of I Am Chris Farley, a documentary about his life. People haven't forgotten his comedic talents either, using his past hilarious work to spice up newer movies likeMission Impossible: Rogue Nation.